TODAY ONLY! 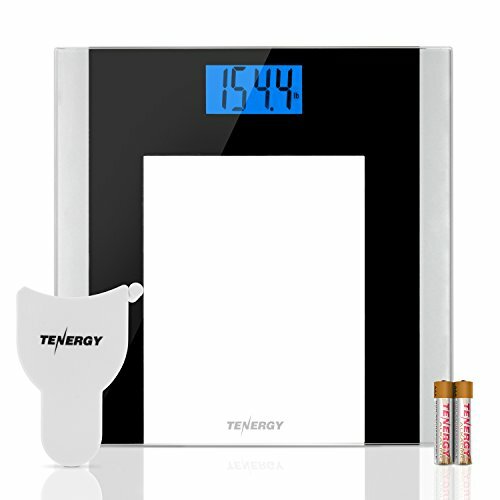 Tenergy Body Weight Scale ONLY $12.99 SHIPPED! SLEEK & DURABLE DESIGN - The Tenergy Digital Body Weight Scale features a see-through platform paired with a black and silver trim. The 8mm thick, 12" x 12" large tempered glass weighing platform supports up to 400 lbs, with a minimum weight of 11 lbs. The digital body scale has been factory tested 10,000 times to ensure durability. EASY TO USE - Simply step on the digital weight scale to get your body weight reading with the auto-ON technology. The convenient reading lock will hold the reading for 8 seconds after you step off. The 3.1-inch backlit LCD screen and oversize numbers can be visibly seen. This is the perfect bathroom scale for any health or fitness enthusiast, weight-loss or weight gain individuals or just any home. TRACK YOUR PROGRESS - Stay on track with your weight gain or weight loss journey as the auto-calibrated Tenergy Digital Body Weight Scale is equipped with 4 highly accurate sensors to show readings with down to 0.2 lbs/0.1kg increments. Easily switch between measurement units (Kilogram, Pounds or Stones) at the base of the scale. BONUS BODY MEASURING TAPE - Take your tracking methods one step further with a FREE body measuring retractable tape. The locking design of the front end of the tape allows you to measure the circumference of your arms, waist, thighs or neck. Also includes Tenergy branded batteries for optimal performance! CE CERTIFIED & 2-YEAR EXTENDED WARRANTY - Backed with CE certification and a Tenergy 2-year extended warranty when you register your Tenergy weight loss scale, you can rest assured that it will be protected. As a precautionary measure, the anti-slip, scratch-resistant ground pads keep the scale in place without damaging your floors.